Lately in Buddha school, the idea of reincarnation has been popping up and I’ve been totally surprised to learn that there are a lot of western Buddhists who do not subscribe to this concept. Honestly, reincarnation is the draw that pulled me into Buddhism initially. I’d never felt so sure about anything before. In this jigsaw puzzle of life, I considered reincarnation my four corner pieces. everything else could be filled in from there. Spiritually I’m coming from a place of I-don’t-know-how-I-got-here-but-I-have-some- pretty-good-ideas. I believe in reincarnation – along with about 80% of the world’s population. And it’s OK to believe in reincarnation and think Jesus is the heaven-sent Mack Daddy. I think that, too. I believe in GOD. I also believe in MYSELF. Picture it. The year is 2008. I’m knocked up with baby #3, sitting on the couch watching Hollylwood’s Top Ten Best Bodies on E! with my stepdaughter CG. For some reason I decide to share with her that I’m not connected to this lifetime. Like I’m not sure I’m supposed to be here. I’m feeling vacant while I say it. A bit lost maybe. It’s not an extraordinary moment in my life, but saying the words aloud causes a strangely physical effect. Sort of like the weight of truth squashing my skull but my head is full of air. Weird, I know. I’m sure it was equally weird for CG. Moving on. Later that week I turn on Oprah and see my future hero Brian Weiss. (Can you tell I watch too much TV? Don’t even get me started on the epiphanies that occur while watching Real Housewives on Bravo.) Dr. Weiss is an Ivy League educated, world renowned psychotherapist who, after years of practice, specializes in healing through past life regression. I pick up Dr. W.’s book Many Lives Many Masters the next day and love every page. Sigh relief. And so the journey begins. I have a few years of material stored up in my noggin now and am eager to share. However, I will take it slow. I want to start off with something we are all familiar with. The feeling that we’ve known someone “before” or that we share a soul connection with another human being. We experience life on earth time and time again so that we can learn lessons in love, compassion and acceptance. Each of us is part of a larger soul family or soul group made up of many souls with a common purpose. We travel through multiple lifetimes with the same souls so that we can learn and evolve together, and also so we can clear up any karmic debt that exists between us (more on that later). These souls could be your family, friends, co-workers, you name it. You may already connect with someone in a special way and call that person a soul mate. S/he can be your wife, your son, a sibling, an old lady who lives on your street, the trash man. Doesn’t matter. Just don’t limit your idea of soul mate to your significant other because you are missing the big picture. Example. LM (hi LM) is my BFFFFFF. We’ve know each other since we were 7 years old and I love her so dearly and deeply that there is not a speck of doubt we are tied together in this three-legged race called life. The parallels in our lives are no coincidence. We were meant to meet each other in Mrs. McGrath’s 3rd grade class, experience our journeys together and help guide each other through this lifetime with compassion. She’s an easy soul mate to spot b/c our love is deep and obvious. But our soul mates do not always spend 30 years by our sides. Sometimes they pop up only for a moment but leave an enduring mark. Another example. I was in Paris last June with my kids and we stopped in a patisserie for sweets. On the way out there was a gypsy boy begging on the sidewalk. I do have a soft spot for the homeless in general, but this boy truly captivated me. I gave him a raspberry yogurt and watched him gobbled it up with delight, my small gesture filling his belly for a few hours. I couldn’t shake that boy. I kept thinking about him – where he would sleep? Did he have family? Would he ever go to school? His grubby little face haunted me while I walked back to our flat and 7 months later (2 years and 7 months now) I’m still thinking about him. I wonder is he a soul mate who agreed to make a guest appearance that summer day? Reaching out to teach me COMPASSION? Maybe he was my baby boy in another lifetime. Maybe my sister. How could I ignore him? How could I not help him? We are all connected. When you understand that the beggar on the street or the thief outside your window was your mother in another lifetime, you will uncover a layer of compassion and acceptance that you didn’t know existed before. It’s really quite beautiful and powerful. 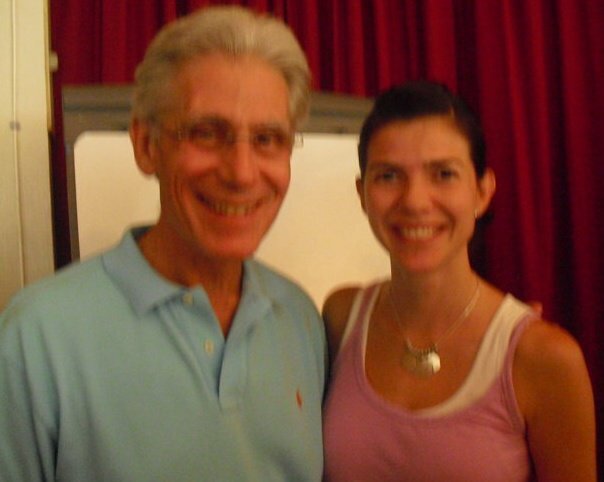 This is me with Dr. Weiss at Omega Institute in Rhinebeck, NY. what a brillian thought vanessa! reincarnation has been an intriguing principle for me. I want to believe in it because used in the right way it can give rise to compassion amongst us. And that has been brilliantly demonstrated by you. However, when reincarnation is combined with karma, I blame it for the poor state of my country today. It has made us Indians incapable of rising, revolting against the atrocities committed on us by our corrupt and absolutely callous governments. We have gotten too used to blaming our past life bad karmas for our sorry state in this life, instead of realizing that we are being looted by our government and its officials. By blaming ourselves and our past life sins, we do not revolt. Sometimes it is better to believe in one life and trying to make it the best that we can. 🙂 you said it…we need a philosophical revolution…unfortunately with 1.2 bn people that is tough to achieve…hopefully it will happen in my lifetime.